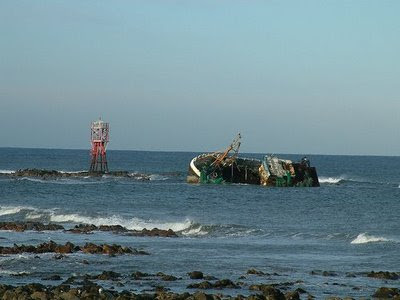 There for all to see is the fishing boat the SOVEREIGN which crashed into it back in December 2005. I don't know how long there has been a warning beacon there. I know the harbour was built in 1920 but suspect that in one form or another a warning light has been there for a long time. Yet a local boat that must have passed it 100 times crashes into it. Always listen for the voice of God even in your comfort zone its there that you need it the most. When God speaks don't ignore it, its for your own safety. Even when God says the same thing over and over again its probably because you still need to hear it. God's warning can sometimes be for things that you would not otherwise see till its to late. Our biggest dangers can very often be when we are close to home, we take our guard down and stop listening to God. If we start to think we are sovereign and forget that God is SOVEREIGN then we are heading for disaster. If we stop listening to God and obeying his voice the wreckage of our lives can be around for all to see for a very long time. Maybe not the most inspiring piece of advice but felt God say: Please would you learn from other peoples crazy mistakes. Psalm 119 v 105 - Your word is a lamp to guide my feet and a light for my path. on the contrary - I think its a very inspiring bit of advice - thanks for including it. We get so blase about God's protection over our lives and forget that He is always on our case, watching over us. We sometimes miss His speaking to us and directing us because we are so confident in our own ability to sort our times out and dont even consider another course! Other peoples mistakes (and our own past ones) can be a great teacher if we will only recognise it.